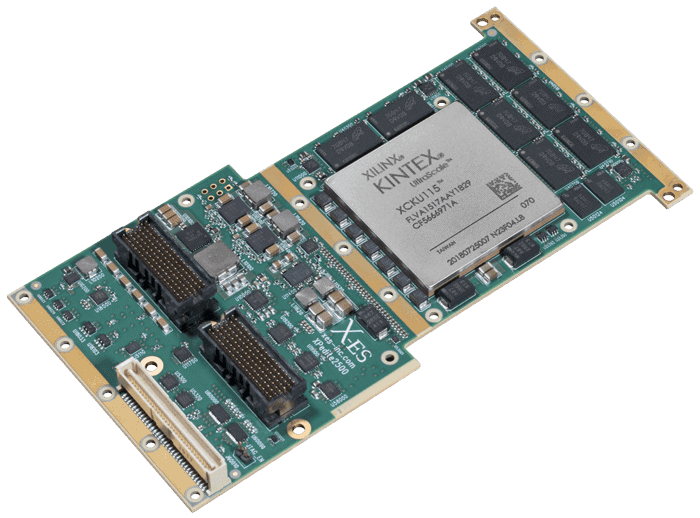 Extreme Engineering Solutions (X-ES) has announced the introduction of the the XPedite2500, a rugged XMC module based on the high-performance Xilinx Kintex UltraScale XCKU115 FPGA. Available in conduction- and air-cooled configurations, the XPedite2500 brings new signal processing capabilities to the XMC form factor for applications such as unmanned aerial vehicles (UAVs) and other robotic platforms. The XPedite2500 is the first mezzanine card from X-ES to feature the Xilinx Kintex UltraScale family of FPGAs. These devices provide an ideal blend of performance and cost-effectiveness for the next generation of embedded applications, delivering the best price/performance/watt at 20 nm and the highest signal processing bandwidth in a mid-range device. The XPedite2500 is based on the Kintex UltraScale XCKU115, which has the highest density of logic elements in the Kintex UltraScale family. This user-programmable device provides ample resources for high-end logic and signal processing, including over 1.4 M system logic cells, 5,520 DSP slices, and 75.9 Mb of block RAM. The XPedite2500 provides a variety of system integration possibilities, with a versatile XMC processing solution that can be installed in both VPX and VME systems. Featuring up to 8 GB of DDR4 SDRAM in four independent channels and numerous options for high-bandwidth I/O, this card is equipped to process streaming data from a wide array of inputs. In addition to a x8 PCI Express Gen3 interface on the P15 connector, it has up to eight High-Speed Serial ports on the P16 connector, which can optionally be configured as a second x8 PCI Express interface. Nineteen LVDS pairs are available on P16, while an optional P14 connector adds 26 more LVDS pairs and 12 LVCMOS for user I/O. The X-ES FPGA Development Kit (FDK) for Xilinx Vivado helps simplify development and includes IP blocks, HDL, test benches, Linux drivers, and complete example designs for the XPedite2500. Address Extreme Engineering Solutions, Inc.